Small Japanese supermarket near Ealing Common Station. Kake has visited several times now, most recently in September 2017. On a Thursday afternoon in February 2009, the place was well-stocked, and the staff member who served me was friendly. On another visit in August 2015, the staff member on duty was very helpful, patiently spending several minutes helping me choose a couple of bottles of sake. Fresh produce is displayed out the front photo. In February 2009, a large Korean pear was 98p. There were various interesting vegetables too; Su-Lin says they stock burdock root. Inside, there's a fridge with things like konnyaku, shirataki noodles, deep-fried tofu (Dragonfly brand, which is made in Devon), some prepacked fish, small trays of sushi, pickles, that sort of thing. There are also a couple of large freezers with things like pre-made dumplings. Further towards the back there's a selection of noodles, instant miso soup, nori, those weird toroidal gluten things for putting in soup, etc. A set of shelves over the other side has Japanese sweets and snacks, and along the far wall there's furikake, kewpie mayonnaise, etc. They sell large sacks of Japanese rice too. A rack by the door holds various Asian magazines, and a display by the counter has several kinds of sake. Most if not all of the products have at least some English labelling on them, though this is often just an ingredient list. Accessibility: A small step to get in. It's very small and crowded inside, and the aisles (all three of them) are very narrow. Last visited by Kake, September 2017. 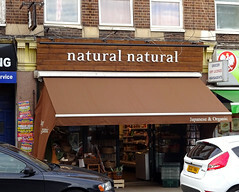 Opening hours taken from the Natural Natural website, September 2017. Last edited 2017-09-14 15:34:03 (version 6; diff). List all versions. Page last edited 2017-09-14 15:34:03 (version 6).